Bandit masked raccoons are a familiar sight just about everywhere and they will eat just about anything. 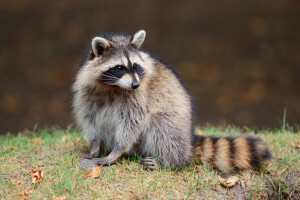 Raccoons are notoriously destructive and filthy. They can rip apart your soffits and wood work, tear up your lawn, and will leave feces everywhere they go. If raccoons get inside your attic space or garage for long periods of time, you will often have to replace insulation, sheetrock and duct work because of urine stains and damage.